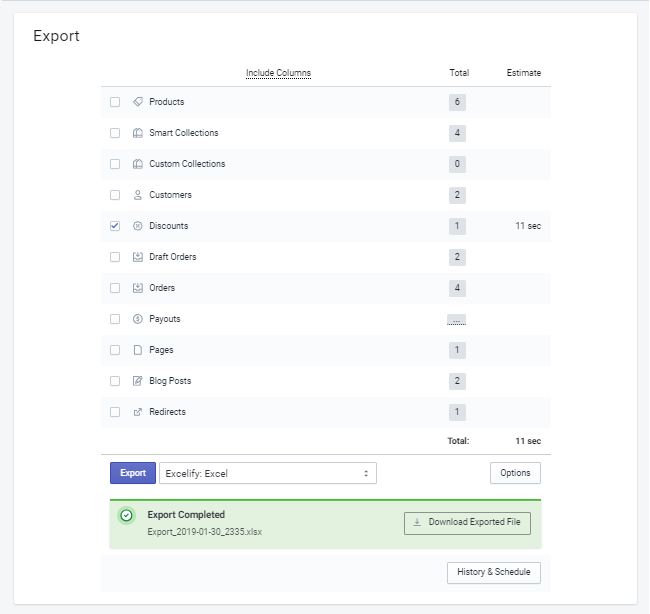 With Excelify you can create your Shopify Discount Codes in bulk by following these simple steps. 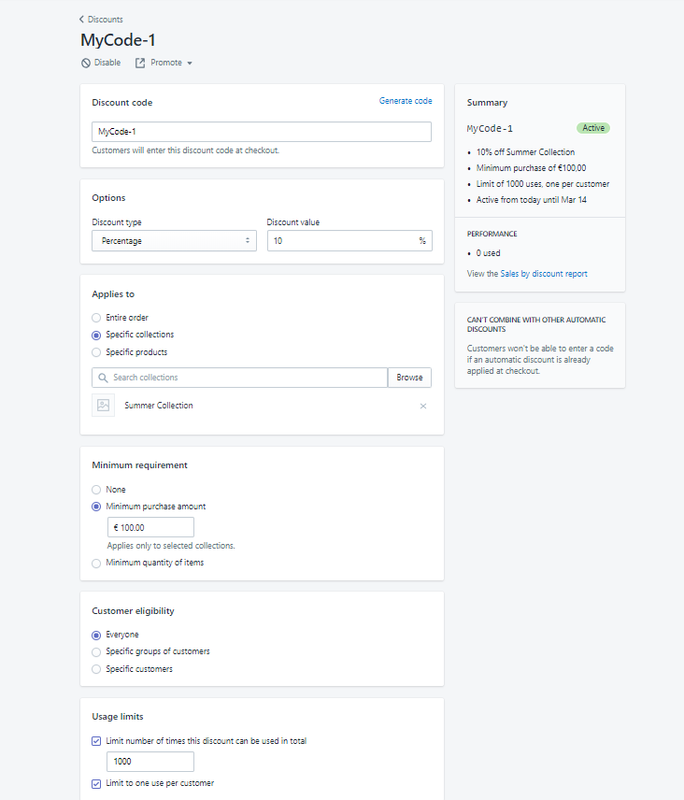 In your Shopify Admin create a discount code as a sample of discount code that you wish to create in bulk. Export your Discount Code using the Excleify app. 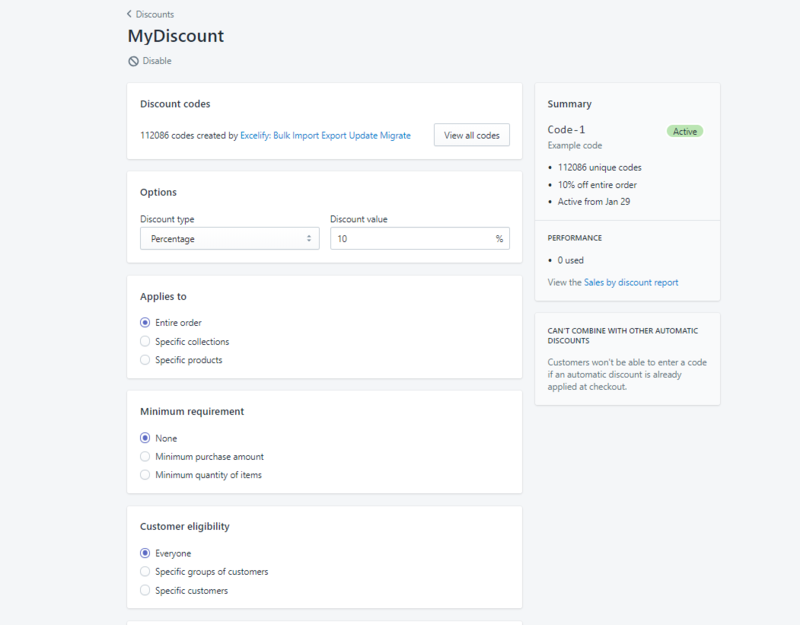 Use those exported Discounts as a template – copy exported discount code in new rows. Update Title and Code columns to your new codes. Update other columns as you need. Save the file and import via Excelify. Enjoy your new Discount Codes. Bonus track: Create many codes for one Discount. 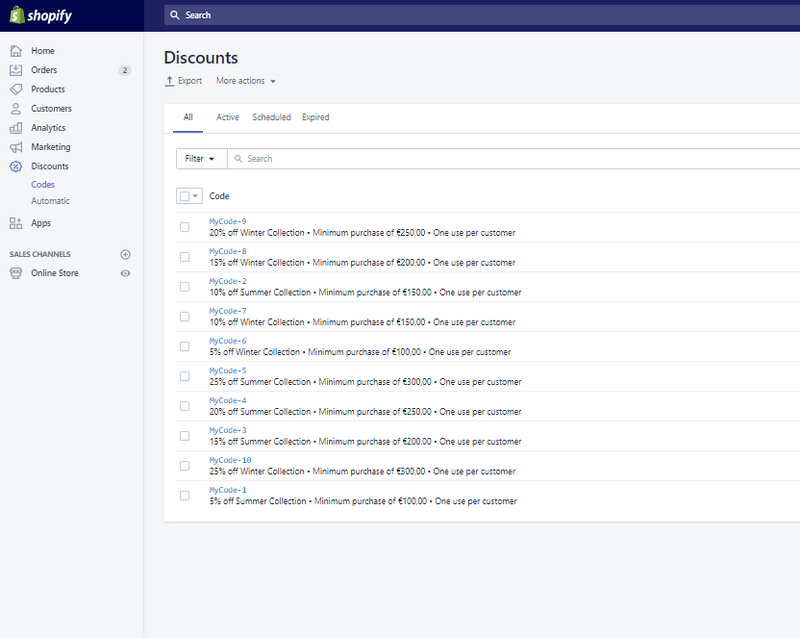 By creating sample discount in the Shopify Admin we make the whole process a lot easier for ourselves. In the exported file we will be able to easier see what values go into what columns for our selected Discount type. I will use the Percentage Discount in our example with as many fields filled as allowed. You can use any other discount type and field combination. Now head over to Excelify app and select “Discounts” checkbox in the Export window. Select “Excelify: Excel” file format and export the file by pressing the “Export” button. We can see the same Discount in Excelify format in Excel file. The first thing to do now would be to duplicate/copy this discount code multiple times. I will make a total 10 Discounts in this example, but you can create as many Discounts as you wish. At the moment the app would see this as one Discount as we do not yet have assigned new codes and titles to each row. For each row to indicate a unique discount – each row should have its own Title and Code. These two columns can and should be the same for a single Discount (if you are not creating multiple codes within a single Discount). At this point, we can check our file and edit other fields. To see more detailed information about every column in our Discount sheet, head over to our Discounts sheet documentation where you can see every column, possible/allowed values and their descriptions. Last important thing to do is to delete the ID column. As we currently have all the same IDs for these codes, the app will still understand them as the same code and will try to update the code by this ID only. Luckily we do not need to list ID as Excelify can identify existing Discount also by its “Code” column value (just it is a bit slower). An ID is assigned to a new Discount by Shopify when Discount is created. You need to use the ID when you want to change the “Code” column value for an existing Discount. So we can just delete this whole ID column for now. Now we can save this file and import it using Excelify App. 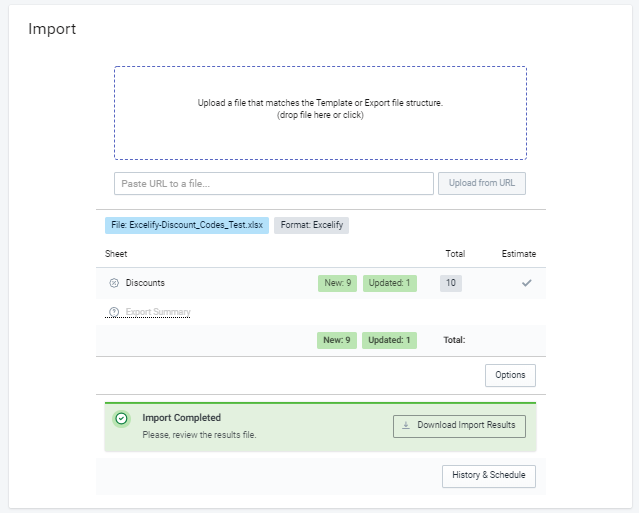 Locate the Import section in the Excelify App and drop the file in the file upload area. The app will analyze the file and count how many Discounts we are importing. If the count does not much the count of Discounts in your file then double check if IDs are deleted and each row have unique Title and Code. If you see any Failed items, then after the import has finished, you can download the Import Results file and look into the “Import Comment” column. It will tell why the particular Discount has failed. Then you can fix that issue and re-import just those failed and fixed rows again. There’s a hidden easter egg in Shopify where you can actually create many codes for one Discount. That is very useful when you need to have many codes with exactly the same conditions. 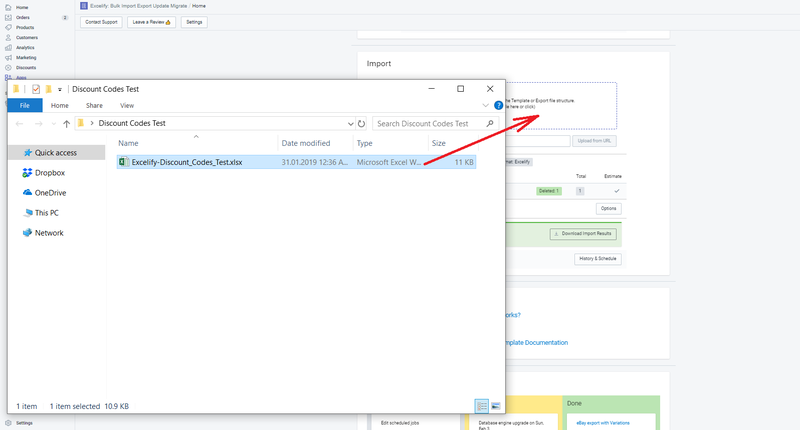 To import several discount codes for one discount, repeat the rows with the same Title, and have different “Code” column value for each of those rows. 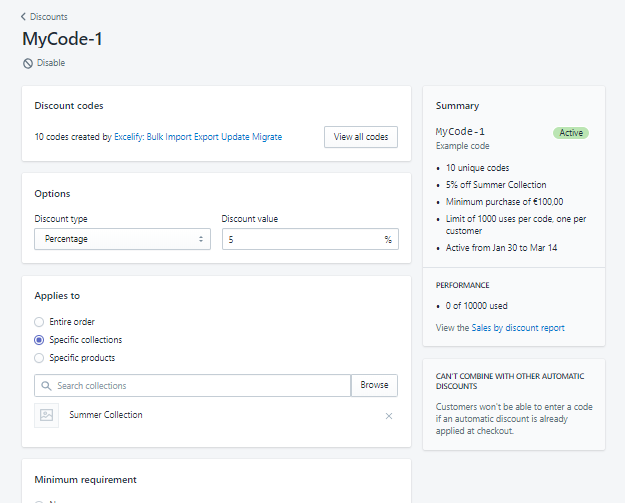 Follow this tutorial for more detailed instructions on how to import several codes for one Discount. How many codes can there be for one Discount? We tested that Shopify allowed us to import over 100’000 Codes for one Discount. At that point, we stopped the experiment, because it seems that there is actually no limit for how many codes you can have for one Discount.